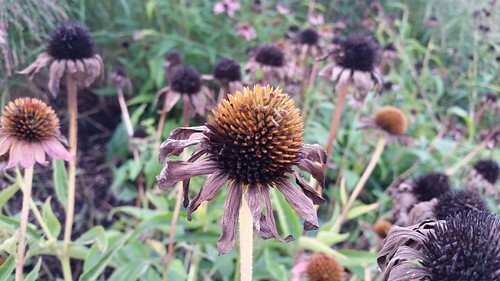 Flowers fading and beginning to die as fall sets in. Early in the spring, these flowers looked rather like little fireballs with their bright reddish/orange centers. But now, as fall sets in they begin their return to the earth from which they have come. However, their transition is on of turning from vibrant colors to black. Even the flower in the center of this photo, we can see the blackness taking over, akin to a flame making its way up to the top. Other faded flowers around it, tell us what its fate will be in the ensuing days, but of course, these are not burnt out flames, but dried buds that will hopefully spread new seeds for the next year.